Antique19th C Dresden Hand Painted Figural Porcelain Lamp. We are pleased to be offering this elegant antique Dresden lamp, hand painted in a scenic figural motif with a gilded wood base. Good condition, some paint loss on the wood base, please view photos for detail. 22'' High to socket 8 1/4'' Wide 8'' Base item#979. Remember, these are antiques or vintage items. Most will show some wear, as they are old, and have been used. We try to show any imperfections or wear in the photos. Please supersize and inspect photos carefully. We do not guarantee the electrical wiring in any lamps or lighting. Although the items are in working condition, the wiring should be inspected prior to use. ALL reasonable offers will be considered. Formerly of New York City, Unique Finds Antiques is a team of decorating professionals located in Blairstown, New Jersey. 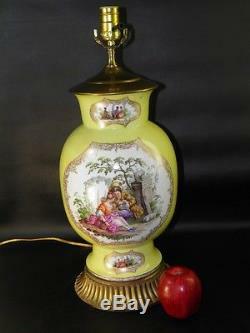 The item "Antique19th C Dresden Hand Painted Figural Porcelain Lamp" is in sale since Saturday, February 25, 2012. This item is in the category "Antiques\Decorative Arts\Lamps".